GRAND RAPIDS, Mich. — Four Republicans running for Michigan governor made their case to voters in their first debate Wednesday night, agreeing on policy points while clashing at times over President Donald Trump, Flint’s water crisis and other issues. The top two candidates — Attorney General Bill Schuette and Lt. Gov. 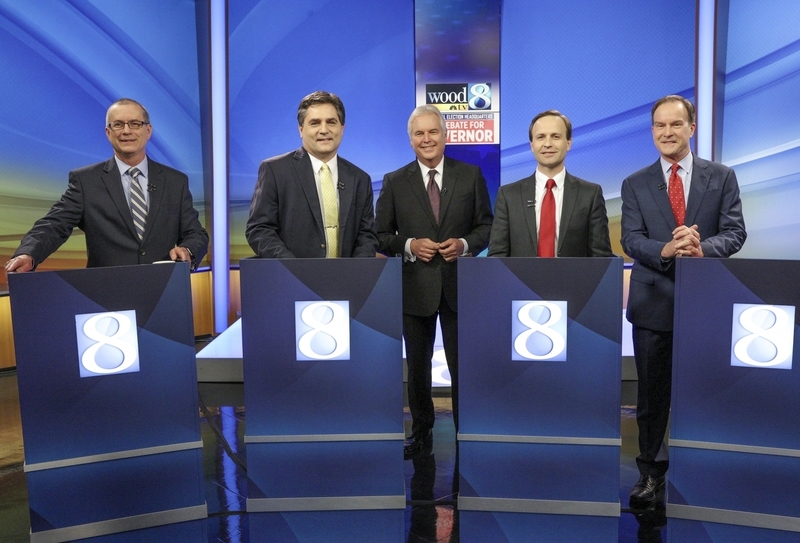 Brian Calley — offered contrasting pitches in the hourlong debate that was organized by the state GOP and WOOD-TV in Grand Rapids. Schuette routinely touted his endorsement from Trump and singled out Calley’s decision to withdraw his backing of Trump in 2016. He also cited plans to cut the state income tax and auto insurance rates. Calley highlighted the state’s economic gains since term-limited Gov. Rick Snyder took office and criticized Schuette for his prosecution of top state officials over the water emergency in Flint. State Sen. Patrick Colbeck said he is an engineer problem solver and the only candidate who can fire up the GOP grass-roots base, and Dr. Jim Hines called himself a non-politician outsider who would bring a new approach to fixing ills such as third-grade reading scores and roads. He pointed to the federal tax cuts and the appointment of conservative judges, including Supreme Court Justice Neil Gorsuch. Calley said he voted for Trump. “I want to make it clear that I support the president. His success is our success,” he said. Calley pointed to division over Trump within the Republican Party in 2016, “but we all got there when it counted on Election Day and he was elected.” Calley, who renounced his support for Trump due to a video recording in which Trump made crude comments about groping women, added that Schuette initially backed Jeb Bush for president and distanced himself from some of Trump’s statements. Calley has trailed Schuette in polling in a race in which many voters remain undecided before August’s primary. He went on the attack at times, accusing Schuette of “speaking in platitudes” without an actual plan to address the high cost of auto insurance. He continued to accuse Schuette of having political reasons for prosecuting government officials for Flint’s lead-contaminated water and a Legionnaires’ disease outbreak. The Snyder administration has been deemed primarily responsible for Flint’s man-made disaster. Calley said he moved his office to the city to help at the height of the crisis but said Schuette has used it as a “launching pad” in his gubernatorial run. Schuette said as governor he would focus on “more jobs and bigger paychecks” and auto insurance rates could be lowered by cracking down on frivolous lawsuits and fraud. He warned that voters cannot afford to “go backwards” and pick a Democrat as a “sequel” to former Gov. Jennifer Granholm, who served before Snyder.